Richard D. Heideman was born in Detroit, Michigan and is a graduate of The University of Michigan (BA, LSA 1969) and The National Law Center of George Washington University in Washington (JD 1972). He completed the American University Law and Policy Institute Abroad at the Hebrew University in Jerusalem, Israel during the summers of 1970-1972. He is licensed to practice law in the District of Columbia, Indiana, Kentucky, Maryland, and Wyoming; he has been admitted to practice in numerous federal courts, including the United States District Courts for the District of Columbia, the District of Maryland, The Northern and southern Districts of Indiana, the Eastern and Western Districts of Kentucky, the Western District of Wisconsin, and the United States District Court for the District of Wyoming. Additionally, he has been admitted before the United States Courts of Appeals for the Fourth, Sixth, Seventh, Federal and DC Circuits, the United States Court of Appeals for the Armed Forces, the United States Court of International Trade, the United States Court of Federal Claims, and the Supreme Court of the United States of America. 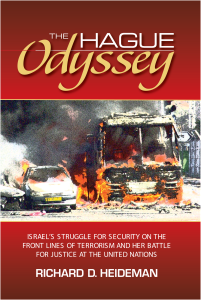 Heideman is a proud supporter of Israel, an avid activist, published author, and father and grandfather. Richard D. Heideman is a Washington attorney who serves as Senior Counsel of Heideman Nudelman & Kalik, P.C., which represents victims of terrorism in actions that have been brought against Libya, Syria, the Islamic Republic of Iran, the PLO, and banking institutions who stand accused of funding or sponsoring heinous acts of terror. In 2016, Richard D. Heideman, as senior counsel of Heideman Nudelman & Kalik, PC, along with his law partners Noel Nudelman and Tracy R. Kalik, is counsel for over one hundred and fifty American plaintiffs against Arab Bank Plc for the facilitation of acts of international terrorism and provision of material support to various terrorist groups involved in the Second Intifada in violation of the Anti-Terrorism Act (“ATA”), which resulted in the death and injury to American nationals. Heideman’s work in corporate matters, such as negotiating and drafting an agreement between the Israeli Partner Communications and the French telecommunications firm Orange, has seen Heideman ensuring all persons are treated equally under the law and dealt a blow to the illegal BDS movement. Richard D. Heideman also actively practices in the fields of general litigation, personal injury, class action/mass torts, business/corporate law, real estate: business law, and nonprofit organizations. In 1985, Heideman served as an NGO delegate to the United Nations World Conference on Women in Nairobi, Kenya; served as President of B’nai B’rith International from 1998-2002 and now serves the organization as Honorary President; he served as chairman of the United Nations Committee of the Conference of Presidents of Major American Jewish Organizations; in 2001 he served as Head of Delegation to the United Nations World Conference Against Racism in Durban, South Africa; in 2009 he served as Head of Delegation to United Nations Durban Review Conference in Geneva, and in 2011 was Chairman of the UN Durban 10-year assessment event. Heideman is currently Chairman of The Israel Forever Foundation and Chairman of the Institute for Law and Policy at the Hebrew University Faculty of Law. Heideman is a registered lobbyist and is actively working to increase the accountability of the PA and PLO in an effort to help American victims of Palestinian terror like the late Esther Klieman. In 2002, Mr. Heideman had the distinction of receiving the distinguished Merito de Mayo decoration by President Duhalde of Argentina, having received in 1988 the Heritage Award from State of Israel Bonds and in 1999 the Sam Beber Distinguished Alumnus Award from the B’nai B’rith Youth Organization. In 2005 he received the Joseph Papp Racial Harmony Award from the Foundation for Ethnic Understanding. He has recently been selected to receive the 2015 Distinguished Alumnus Award from George Washington University and is currently or has previously been listed in Marquis’ Who’s Who in the East, Who’s Who in America, Who’s Who in the World, Who’s Who in American Law, Who’s Who of Emerging Leaders in America, and Who’s Who in Finance & Industry. In 2016, Heideman, along with his law partners Noel Nudelman and Tracy Kalik, received the Trial Lawyer of the Year Award by Public Justice for their work against the Arab Bank Plc. Speaking engagements and interviews can be arranged through Ariana at Starburst Communications.